A tip of the hat to Temple Grandin, who was honored at Sunday’s Golden Globe Awards after the HBO film based on her life won a best actress award for Claire Danes. In her acceptance speech, Danes thanked Grandin for, “working with incredible zeal and devotion to illuminate mysteries about autism and animal behavior.” The biopic, Temple Grandin, was based on Grandin’s autobiography, Thinking in Pictures, about her experiences growing up with autism. Dr. Grandin, as you may know, is an animal welfare activist credited with spearheading widespread reforms in livestock housing and handling. 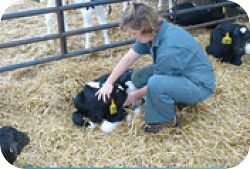 When it comes to dehorning, she has repeatedly recommended that calves be disbudded within the first few weeks after birth. When she’s not designing livestock housing facilities or advocating on behalf of people with autism, Grandin is a professor of animal science at Colorado State University. Hopefully, she is passing along the benefits of early disbudding to a new generation of livestock producers.